The trust is recognized as a separate taxable entity for federal income tax purposes and is governed by rules similar to that of individuals. It is an arrangement whereby a trustee is appointed to manage property for the benefit of beneficiaries. 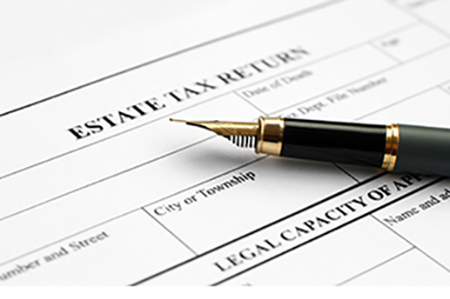 The estate or trust must file a return on Form 1041 if it has gross income of $600 or more. An estate or trust is generally regarded as a conduit with respect to its income and is allowed a deduction for the portion of income that is currently distributable or distributed to the beneficiaries. The income allocated to a beneficiary is taxed in the beneficiary’s hands and retains the same character that it had in the estate or trust. The American Taxpayer Relief Act of 2012 (“ATRA”) raised tax rates on individuals, estates and trusts. The maximum bracket increased from 35% to 39.6%. The capital gains bracket increased from 15% to 20%. For individuals, the maximum brackets are effective once taxable income exceeds $400,000 for an individual, and $450,000 for taxpayers married filing jointly. The threshold for head of household is $425,000 and for married couples filing separately $225,000.30. The income tax rates for trusts and estates are extremely condensed. Once the estate or trust has taxable income in excess of $11,950 the maximum brackets of 39.6% for ordinary income and 20% for long-term capital gains applies. In addition, the 2010 health care law ushered in a complex new Medicare contribution tax of 3.8% on Net Investment Income (“NII”) in excess of certain thresholds. Avoid condensed trust and estate brackets, utilize the beneficiary’s lower tax brackets and avoid the 3.8% surtax. By utilizing the beneficiary’s income tax brackets there may be an opportunity to not only avoid the 3.8% surtax, but to take advantage of the beneficiary’s lower tax brackets. The key to achieving these results is to effectively utilize the special deduction available to estates and trusts for distributions to the beneficiary. Due to the fact that the estate and trust operate as a conduit, by distributing the income, including NII, to the lower bracket beneficiary substantial tax savings may result. There are many unique aspects of trust and estate income taxation which will help lower the respective income taxes. Executors and trustees must adhere to fiduciary standards and owe duties of care and loyalty to all beneficiaries and participants in the estate and trust. Therefore, fiduciaries must be knowledgeable about the individual beneficiary circumstances as well as the overall structure of the entity. Drafting for suitable discretion will help the fiduciary better manage these considerations. Fiduciaries must carefully document the factors which they are considering and make their decisions accordingly.